That calendar in the middle of the kitchen is a happy thing. Everything is at a glance so I don't have to remember all of it. whew! UNO: So my first goal for 2015 is to cut down on fast food. Like when I’m working and need something quick, or I’m craving the dreaded delicious cheeseburger. Or when it’s been a long day and pizza is just easier than forgetting dinner again. I have a freezer full of ready to make crockpot meals (that can also be cooked in my super cool covered baker in the microwave), not to mention frozen veggies and fruit for quick sides and smoothies for breakfast. If I can eat the food we have at home, I’ll be able to experiment more with fun lunches (and use those bento boxes!) for myself, save money, and everyone eats healthier. I’m the one in charge of groceries and food consumption, so if I eat better, so do they. Win-win. Of course, consuming less gluten will also be high on this list. Luckily for me, fast food tends to go hand-in-hand with bread and I already cut it out at home. DOS: My next goal is to really make an effort speaking Spanish. I tried it last week while doing some inspections, and guess what? Everyone was super helpful and we had fun being bilingual together. They seemed surprised I knew as much conversational Spanish as I do, and so was I, honestly. I started learning in 7th grade, all the way to college. I never had many people to speak it to though, but I can read it and understand it very well. It’s mostly a matter of confidence, so I’m throwing that out and giving it a go. A good friend from high school learned to speak fluently only because he was the only one in his office at the time that could speak more than 5 words in Spanish, so at his call center all of the Spanish speakers were sent to him. He was nervous but said absolute every one of his callers were helpful and that’s how he learned. Being truly bilingual has always been a dream of mine, so this is the time to get going on that. I love this state, it’s cultures, and especially the languages. If I can master Spanish, I may try for German someday. 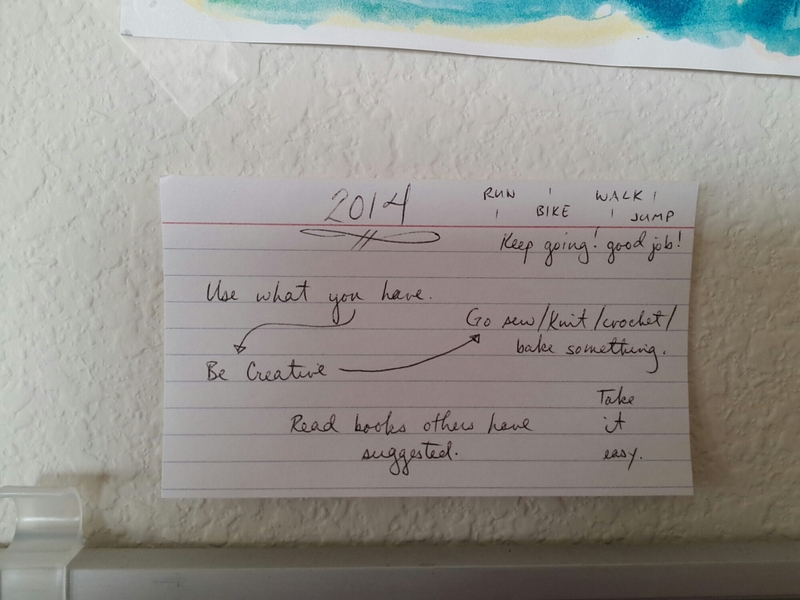 So how am I starting these lofty but achievable goals? I have only been out to fast food twice in the last two weeks. We like to run errands on Saturdays and get lunch (all four of us) and Freddy’s Steakburgers is a favorite. I tell you, that special family burger was really good, not just because Freddy’s is awesome, but because it was the only cheeseburger I’d had all week. Yesterday we met friends at a local diner joint (Ironwood Kitchen) and I had some seriously yummy tacos. Yay for homemade salsa!! I have a brick of frozen spanish rice with hamburger for the crockpot tonight. I spoke quite a bit of Spanish at my sites on Friday and had a great time. I learned a couple new words too. My favorite phrase right now is “Perdi mi pluma” which is “I lost my pen”. I do that a lot, lol. 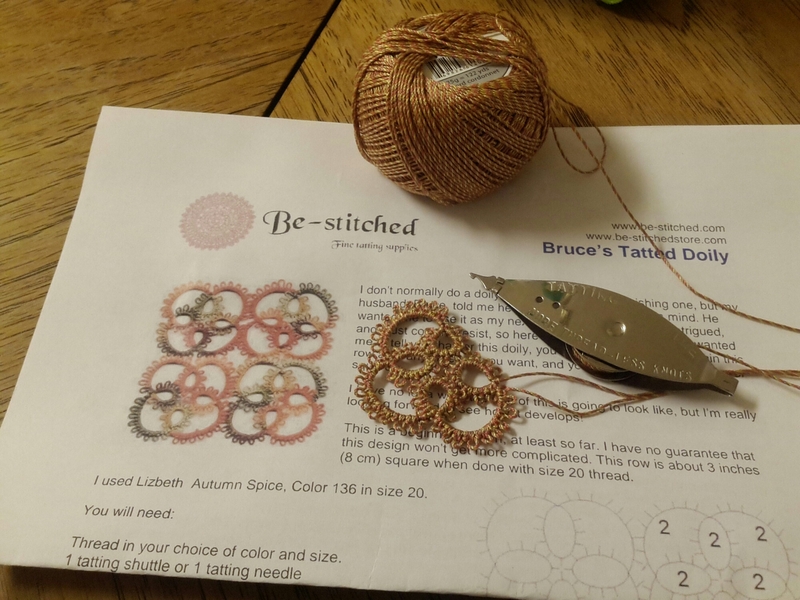 And I’m planning on getting the yard done after hitting “publish”, then watching movies with the little guys and stitching all afternoon. Sounds like the start of a very good year. P.S. This post needs more pictures. Este post necesita màs fotos. New doily for funsies, step one of four. 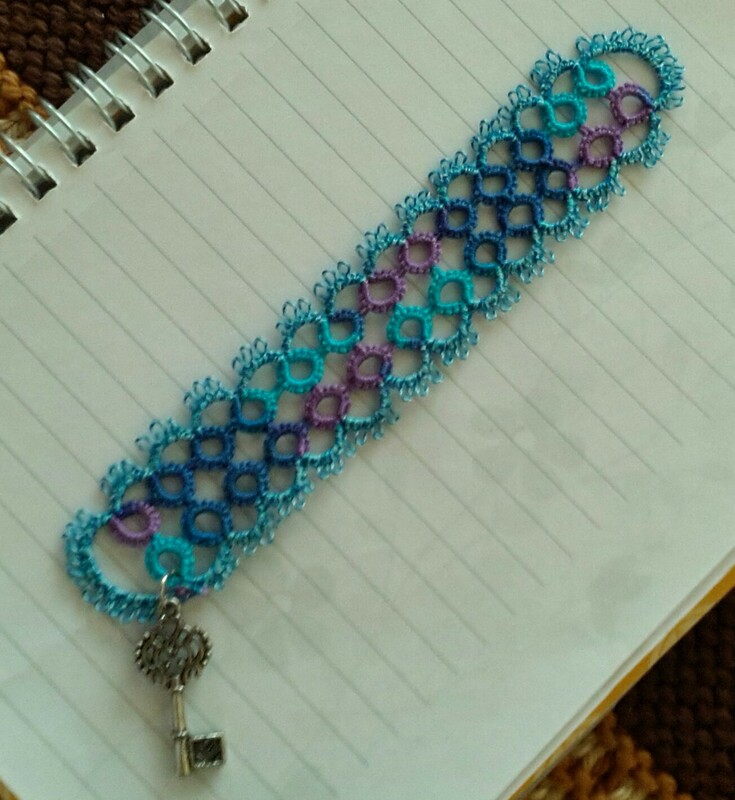 A pretty bookmark I made last month with new thread. I love adding charms to bookmarks.